Progress is a fickle beast. The start of the Sixers season was as bad as anybody could have imagined. A 1-30 record, Robert Covington and Nerlens Noel struggling to replicate their success from last year, and an embarrassing set of off-court incidents for rookie big man Jahlil Okafor. That all changed on the night before Christmas, when the Sixers reacquired veteran point guard Ish Smith from the New Orleans Pelicans for a pair of second round draft picks. The returns were immediate, as the Sixers won twice as many times during the first three games of the Ish Smith era as they did during the previous thirty one contests combined. 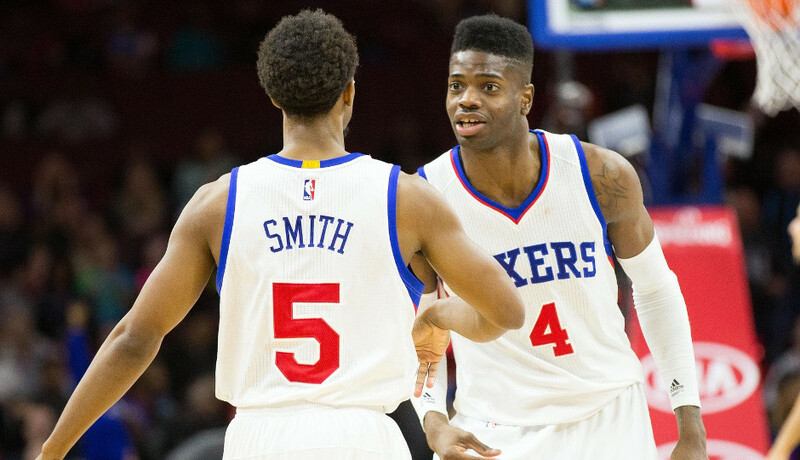 The Sixers have now gone 6-11 since reacquiring Smith. With the exception of games against the Los Angeles Clippers and Atlanta Hawks, the team has been competitive night in and night out with Smith at the helm. Perhaps most importantly, the Sixers two most important players have both improved substantially, improvement which has been well-documented. Rookie big man Jahlil Okafor went from shooting 45.8 percent from the floor prior to Smith’s arrival to 59.3 percent since. Nerlens Noel went from averaging 9.8 points on 45 percent shooting to 12.0 points on 64.4 percent. That improvement carried over to the team as a whole. The offense went from averaging 91.1 points per 100 possessions while shooting 41.8 percent from the field to averaging 99.4 points per 100 possessions on 46.0 percent shooting from the field. The pace the Sixers are playing at right now — with a 35.3 percent winning percentage and a net rating of -3.6 points per 100 possessions — would place them right around a 30 win mark over the course of an 82 game season. The difference was immediate and undeniable. It also goes to show how fickle progress can appear to the outside eye. If all that was between the Sixers and actual, competitive basketball, from a laughing stock of a team to one that was consistently competitive, from one that appeared to have its best players regressing to one where they’re now showing ability that wasn’t imagined at the the time of their selection, was a journeyman run-of-the-mill replacement level point guard, doesn’t that signify that the pieces surrounding him may not have been in as dire of a situation as the results indicated? Sports are, and always have been, a results-oriented business. It’s about wins and losses, about a player’s productivity, or a lackthereof. If a team is winning, it’s progressing. If a player is producing, he’s developing. This all makes sense, as the point of player development is to mold a player into the best and most productive version of that player he can be. It’s a process intended to yield results down the line. But as the improvement of Nerlens Noel has shown, context matters. Nerlens Noel didn’t develop any new high-level skills in that period between December 23rd and December 25th. His understanding of the game hasn’t drastically changed. His change in productivity is more the result of a change in opportunity than one of ability. We, as sports fans, are only given so much data to evaluate progression. Did the team win or did it lose? Did a shot go in or did it not? How frequently does all of this happen? But given how much context and situation can impact performance, as Ish Smith has shown, it’s not always the only, or even best, way to measure whether a player is making progress or not. The regression of a player’s success does not necessarily mean he has regressed as a prospect. Noel’s long-term upside is not different than it was back in December, we’re just seeing more of that upside realized on the court. It’s not that we, as basketball fans, try to be obtuse about the realities of the situation. We’re just left with very little information to make a meaningful determination. We don’t have access to see whether a player’s jump shot is improving in practice, whether the work they’re putting into their ball handling behind the scenes is close to paying off in a meaningful way. We don’t have a real ability to measure their improvement in understanding the game outside of the 48 minutes a couple of times per week that we see them produce on the basketball court. Because of that we try to measure this improvement with the information we do have, the results on the court. At times this can cause the lack of success to mask the positive development being made. None of this is to say that letting Ish Smith walk last offseason was anything but an oversight. This is still a game played by humans, and human motivation an ever-present part of the equation. Ish Smith may have changed the position Noel and Okafor were in more than the skills and long-term abilities of each, but a series of small rewards can go a long way towards motivating players, especially on a team that’s still a ways away from achieving the big team-based rewards of their hard work. A win here, a dunk there, a blocked shot, all positives outcomes that can all go a long way towards providing the positive reinforcement that their hard work is paying off, even if it comes in small dribs and drabs. That reinforcement can provide motivation, and motivation is at the forefront of personal development. And while Ish Smith may not have changed the long-term potential of either Okafor or Noel, his presence does provide fans, and members of the Sixers front office, with a better ability to measure each player’s potential for long-term success. If for no other reason, that increased ability to witness, measure, and predict the success each of these players can have by providing on-court demonstrations has provided the Sixers with valuable information on how, and around whom, to construct the team going forward. But what the Sixers’ improvement under Smith also shows is that, perhaps, the Sixers rebuild wasn’t in quite the dire straits that the lack of on-court success signified. This was still a franchise with immensely talented young players like Nerlens Noel and Jahlil Okafor on the roster. With a potential force in Joel Embiid waiting to be unleashed if that pesky navicular bone in his right foot ever cooperates. With a series of draft picks — their own, the Lakers pick, the Sacramento pick swaps — which all have the chance of adding franchise players to the Sixers pipeline of talent. That upside was always there. It just took Ish Smith to remind us of that. Derek Bodner covers the 76ers for Philadelphia magazine’s Sixers Post. Follow @DerekBodnerNBA on Twitter.